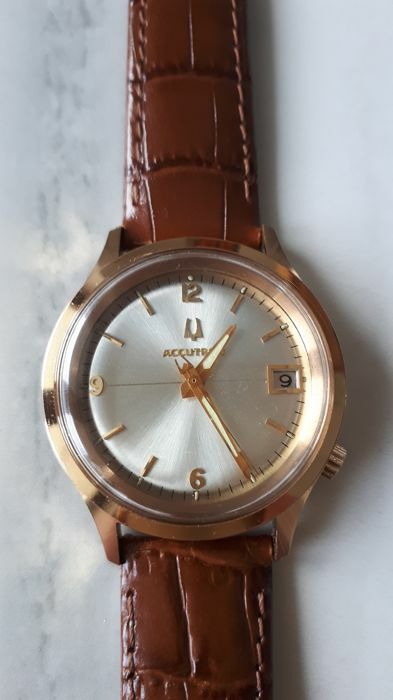 Up for auction is a rare Vintage 1976 N6 Bulova Accutron 218 date tuning fork watch. 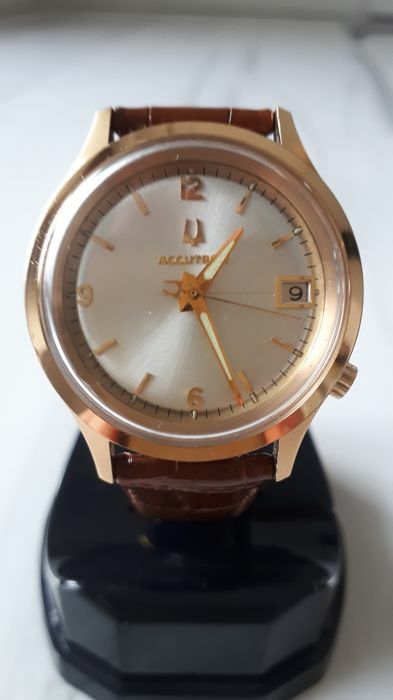 The dial is silver structured sunburst effect one with raised arabic golden numerals (12,6,9) hour pointers and logo plus horizontal mark line – mint condition. 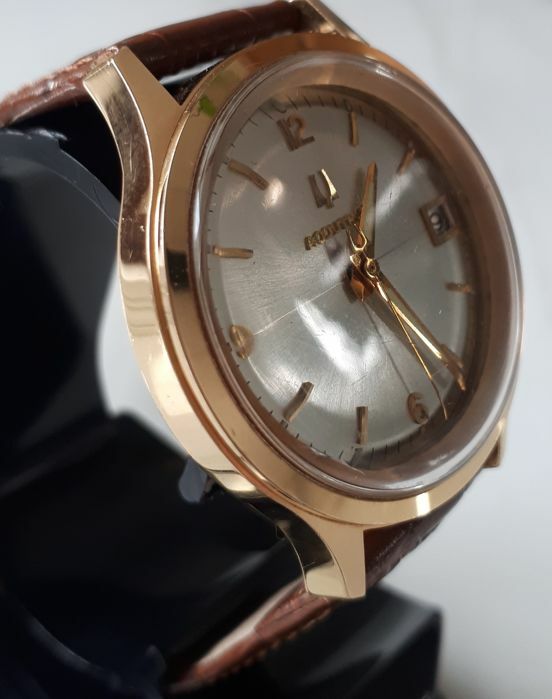 The golden hour, minute and second hands are in mint condition. Second hand is a tuning for end version. 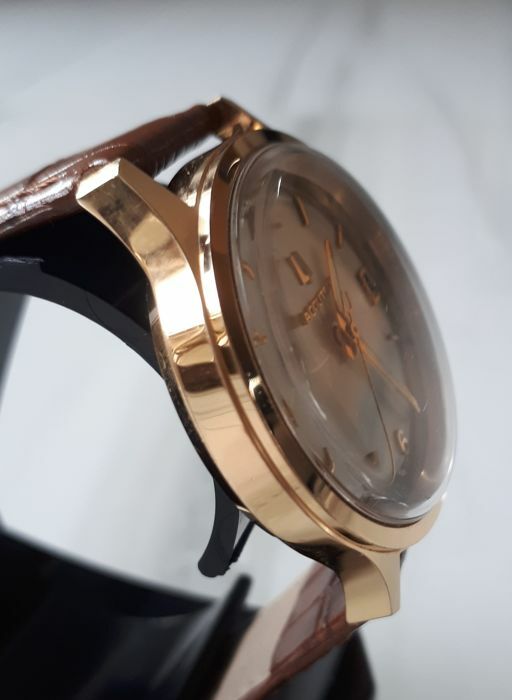 The 35mm case has gold plate bezel and stainless steel back. Case is in almost mint condition with micro marks - never polished. 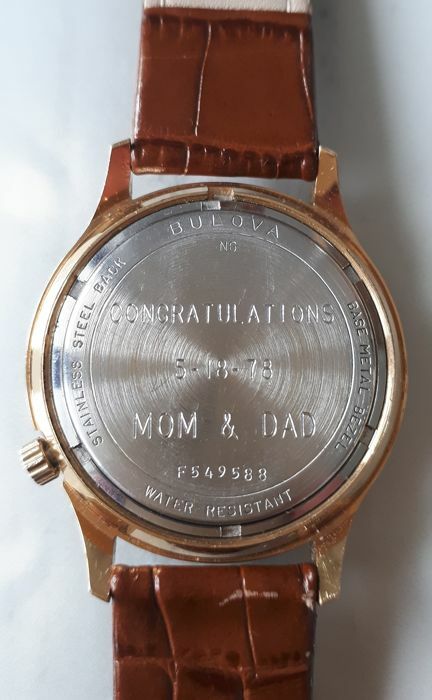 The back of the casing is signed as follows: “BULOVA N6 BASE METAL BEZEL STAINLESS STEEL BACK F549588” Plus personalized inscription on the back. Genuine NEW glossy high quality brown american bufallo strap is measuring 23 cm end to end with the pin buckle. The strap suits great the watch. 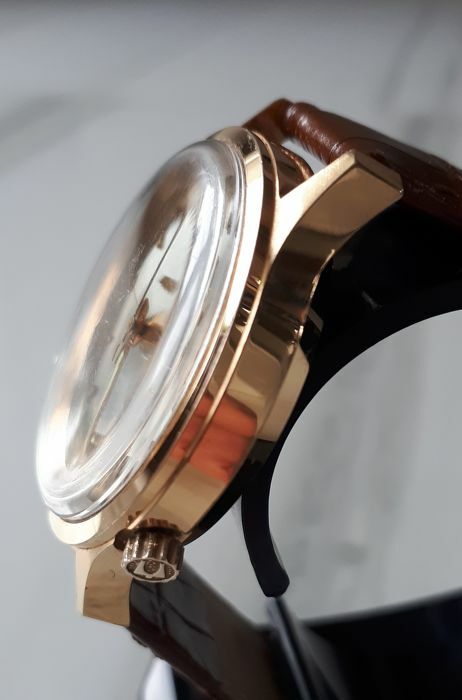 The 218 movement is in good working condition and is keeping good time, date change works as it should. 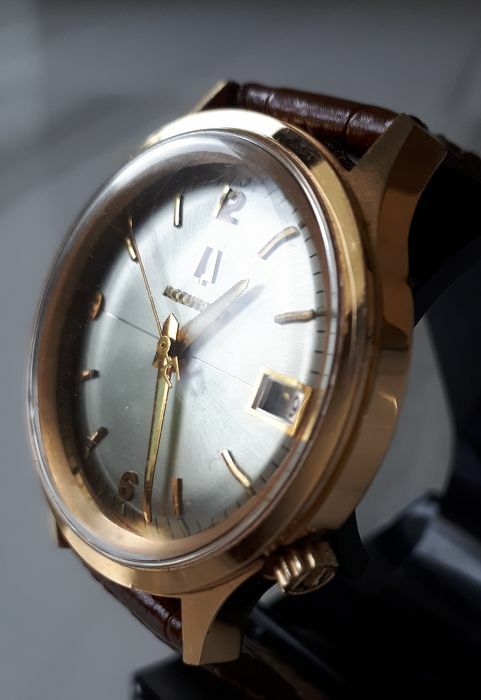 The case and crystal are in very good condition considering that it is over 45 years old. 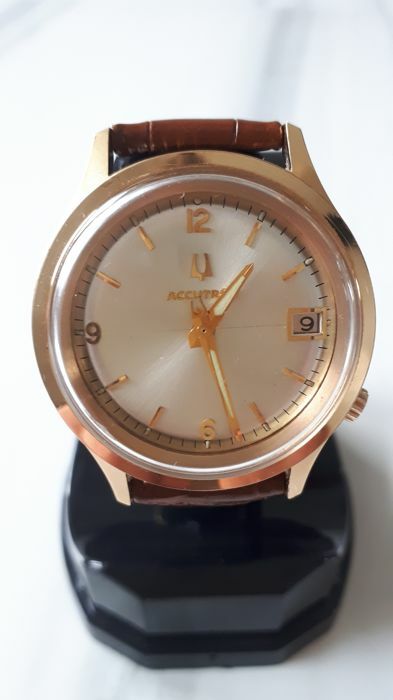 As I know all parts of the watch are all original and in great condition. New battery has been installed. No box nor documents. All custom payments are on the side of buyer. 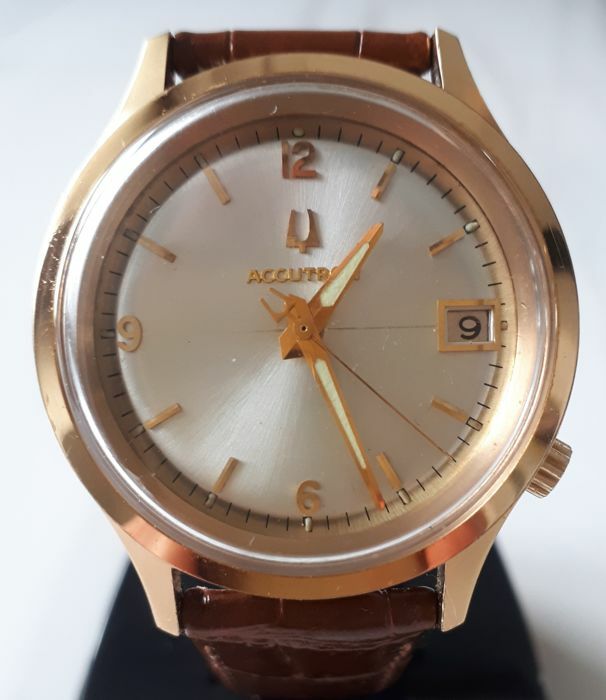 This watch is a great candidate for a daily user or a dress watch. It presents great on wrist. Great condition, never polished. There are fewer and fewer nice Accutrons out there and all the time gaining value. The watch will be securely packed and send with priority and signature confirmation. 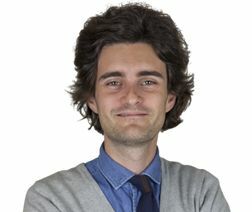 Empaquetage très correct, montre à diapason en très bonne état, par contre la montre retarde de 7 minutes en 24 heures alors que la pile est neuve. Watch really beautiful and better than described. Really mint conditions considering the age of 45 years. Well packed and protected and fast delivered. THANKS! Just received the beautiful watch, looks exactly as is written here. It only takes really much the time before it is here in Amsterdam from Poland. That's not a failure from the seller (20-11/4-12). Very well impressed by the fast shipping, the careful wrapping of the watch, and the fast shipping. And the watch is exactly how it was described.